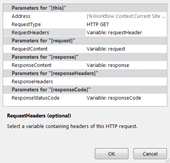 The problem occurs, because the SharePoint server needs to know which type of data you want to receive. This can be achieved by adding an Accept header and the data type. To be able to consume the data inside the workflow as a dictionary application/json;odata=verbose can be used.